1. I think the coolest aspect of The MMQB training camp tour is its successive nature. Visiting teams back-to-back (to back-to-back...) reveals some interesting contrasts. Take, for instance, a 24-hour span during which we saw Jameis Winston’s Buccaneers and Marcus Mariota’s Titans. Winston’s three interceptions certainly juxtaposed interestingly compared to Mariota’s clean, fluid session. I won’t make grand assumptions on that tiny sample size, but I was struck by what happened afterward. Winston, the No. 1 pick, gets swarmed by nearly two dozen reporters and a handful of camera crews jostling for position. His interceptions become headlines, tweeted about incessantly. Winston is monitored closely by Buccaneers employees. In Nashville, meanwhile, there are only a handful of local reporters. Mariota answers questions, coolly, and moseys around his own locker room without interruption. • FOLLOW THE MMQB TRAINING CAMP TOUR: The MMQB blog is updating as the team makes stops at training camps across the NFL. 3. I think the NFL’s manufactured hysteria over Deflategate gets more ridiculous by the day. As much fun it is to muse over fodder from Tom Brady’s released emails—like the fact he calls his offensive coordinator “babe”—it deviates from the important conversation: How did we even get to this point? There is mounting evidence that the NFL seriously bungled this investigation, and that’s something that should not be ignored. 4. I think on a related note, Sally Jenkins of The Washington Post makes an excellent point when she says the unsealing of the Brady hearing makes her believe all legal actions in the NFL should be unsealed. “What else did Goodell so aggressively misstate?” Jenkins asked on Twitter. 5. I think we live in strange times when Chip Kelly holds DeMarco Murray out of practice after tracking his hydration levels and Gus Bradley sits Marqise Lee because his “GPS is too high.” But hey, maybe two of the tech-savvier franchises are on to something. Two days after he returned, Lee tweaked his hamstring running a route. 6. I think I’m glad the NFL is instituting a new medical timeout rule. It could have prevented Julian Edelman from staying on the field in the fourth quarter of Super Bowl XLIX—or at least ensured it was safe for him to remain on the field. 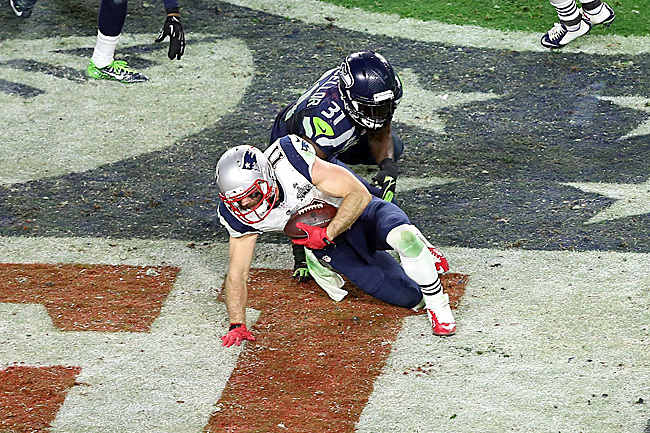 Most people who saw Kam Chancellor’s dizzying hit believed Edelman should have been evaluated for a concussion. Because the Patriots were in hurry-up mode, no one on the sideline could intervene. Maybe Edelman was fine, but why take that chance and why leave a decision like that up to the player? 7. I think if things don’t work out with Jay Cutler this season, the new regime of general manager Ryan Pace and coach John Fox could have a tumultuous run in Chicago. They’re in danger of reaching the same quarterback purgatory the Bills find themselves in—not bad enough to get a top quarterback in the draft, but not good enough to break through to the playoffs. • CUTLER’S LAST STAND: On his third head coach and fifth offensive coordinator, Jay Cutler has one final chance to make it work in Chicago. 8. I think Eddie Royal was a really smart signing for Chicago. When you’re trying to instill confidence in a quarterback whose ego is as bruised as Jay Cutler’s, why not give him a piece he’s familiar with? The tandem have chemistry from Cutler’s rookie season with Denver, and that was absolutely apparent in the 90-minute practice I watched on Thursday, as Royal was on the receiving end of the bulk of Cutler’s best throws. • CHICAGO SHOULD RELY ON AN OLD STALWART: Why Matt Forte should be the offensive focal point for the Bears’ new regime. 10. I think my new favorite pre-training camp story was relayed to me in Bourbonnais by Jarrett Payton, son of Walter, now working as a radio host. “I’m just a kid, and all of the sudden my house starts shaking,” Jarrett begins. The floorboards rumble, the trees outside sway. Jarrett walks outside to see a helicopter land on his front lawn. Sweetness is loading it up with duffel bags. “Time to go to camp,” he says. Then the local cops arrive and begin scolding Walter—apparently landing a chopper, unannounced, in suburbia is not cool. “Don’t worry about it,” Walter says. He climbs in the helicopter and flies away. • SWEETNESS AND THE SCOUT: The qualities that Chargers scouting director Kevin Kelly looks for in a prospect are the same he saw in his mentor, Walter Payton, with whom he struck up an unlikely friendship on a fateful night in an empty gym as an awestruck teenager.